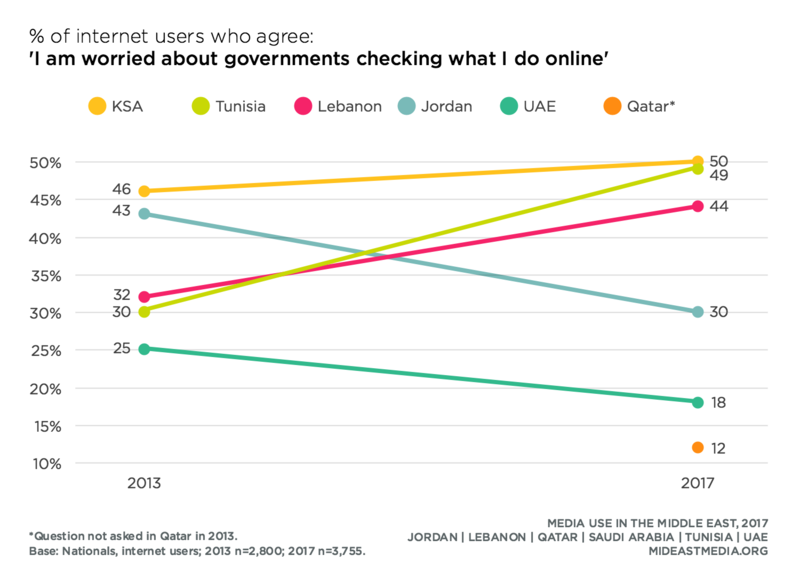 Many people think about privacy when using the internet, and in fact, a sizable minority of Arab internet users worry about governments and companies monitoring their online activity (39% government, 43% companies). Concern about companies monitoring individuals’ online activity is growing at a faster pace than concern about government surveillance. Since 2013, concerns about companies checking individual online activity increased by 11 percentage points while concern about government monitoring increased by five points (companies: 34% in 2013 vs. 45% in 2017; government: 36% in 2013 vs. 41% in 2017, among internet users). Internet users in all countries express more concern about companies than governments checking what they do online. Saudis, Tunisians, and Lebanese report the highest rates of concern for both, while Jordanians, Qataris, and Emiratis have the lowest rates of concern (companies checking: 53% KSA, 53% Tunisia, 46% Lebanon vs. 35% Jordan, 25% UAE, 21% Qatar; government checking: 50% KSA, 49%Tunisia, 44% Lebanon vs. 30% Jordan, 18% UAE, 12% Qatar). Concern about online surveillance rises with education. The most educated internet users (university or higher) are three times as likely as the least educated (primary or less) to express concern about governments and companies checking what they do online (government: 16% primary or less vs. 44% university or higher; companies: 14% primary or less vs. 39% university or higher). Those who advocate for more regulation of the internet are much more likely than those who do not support such regulation to express concern about online surveillance by governments and by companies—a 35 percentage point difference for both. Half of those who support more internet regulation are worried about government and corporate online surveillance, compared to only one in seven who do not support tighter regulation (government: 54% agree increased regulation vs. 15% disagree; companies: 49% agree vs. 13% disagree). Those who agree that people can have greater political influence by using the internet are also more likely to express concern about government and corporate online monitoring compared with those who disagree—by more than 10 percentage points (government: 49% agree greater influence online vs. 37% disagree; companies: 46% agree vs. 33% disagree). Those who agree it is okay to express unpopular ideas on the internet are also more likely to be concerned about online monitoring compared with those who disagree—by nearly 20 percentage points (government: 53% agree okay to express unpopular ideas vs. 33% disagree; companies: 48% agree vs. 30% disagree). Nationals who worry about governments checking what they do online are more likely to be Facebook users than those who are not worried but less likely to be WhatsApp or Instagram users (Facebook: 75% worried vs. 66% not worried; WhatsApp: 71% worried vs. 79% not worried; Instagram: 34% worried vs. 42% not worried). American internet users express more concern about online surveillance by both governments and companies compared with Arab internet users. Half of American internet users worry about governments and six in 10 worry about corporations checking their online activity (2015: government: 39% Middle East vs. 49% U.S; companies: 43% Middle East vs. 60% U.S.; U.S. data: World Internet Project, 2015). 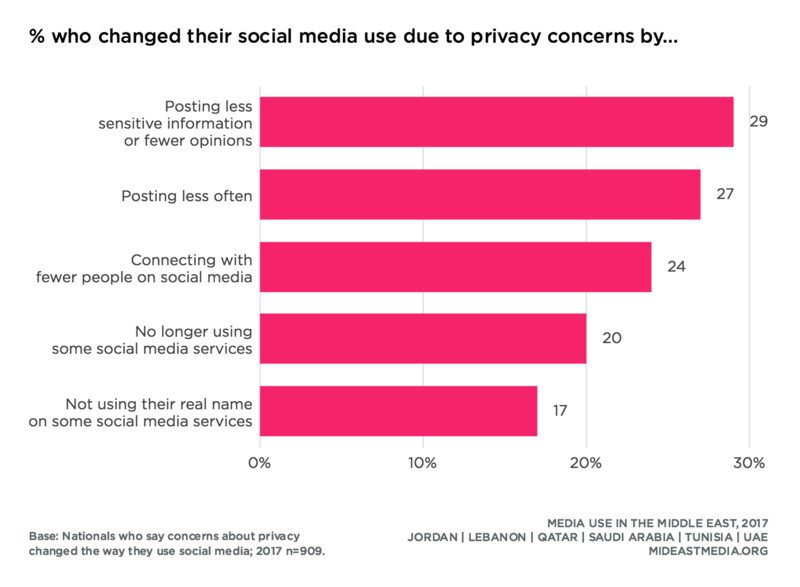 Privacy concerns have not impacted how most Arab nationals use social media; only one in five nationals say that concerns about privacy have changed the way they use social media. 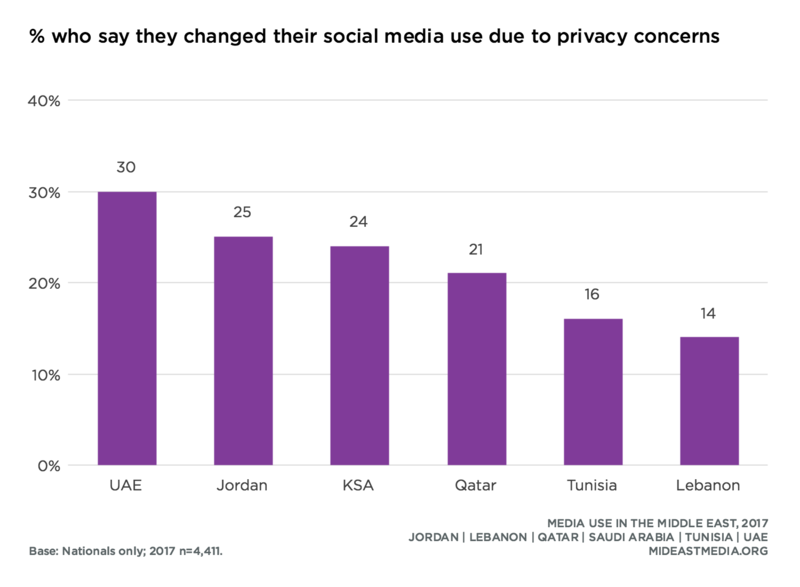 Jordanians and Emiratis are the most likely to say their social media behavior has changed due to privacy concerns, while Lebanese nationals are the least likely to say the same (31% Jordan, 30% UAE vs. 15% Lebanon). Changes in social media behavior are rare across all nationals. However, among the 23% who have made changes, the most common strategies include changing privacy settings (33%), posting less sensitive information (29%), posting less often (27%), and connecting with fewer people (24%). Use of virtual private networks (VPN) varies widely by country. 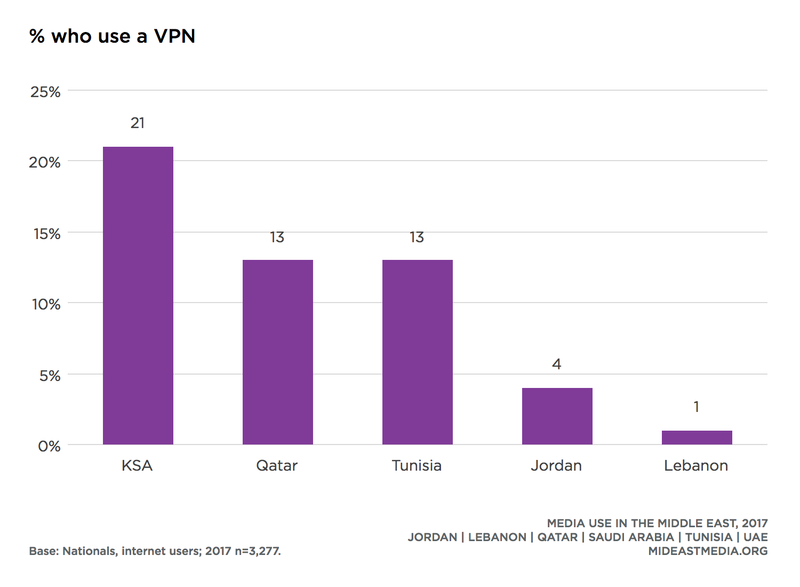 One in five internet users use a VPN in Saudi Arabia compared to almost none in Lebanon (21% KSA, 13% Qatar, 13% Tunisia, 4% Jordan, 1% Lebanon). The question of VPN use was omitted in the 2017 UAE questionnaire since its use was banned in 2016. VPN use decreases with age (11% 18-24 year-olds, 9% 25-34 year-olds, 6% 35-44 year-olds, 3% 45+ year-olds). Long-time internet users are more likely to use a VPN than those newer to the internet (14% 10+ years online vs. 7% less than 10 years). More than half of Arab nationals feel the internet in their country should be more tightly regulated, roughly unchanged from 2013 (59% in 2013 vs. 56% in 2017). Nationals in Lebanon are twice as likely as those in Qatar and the UAE to favor greater internet regulation (80% Lebanon vs. 41% Qatar and UAE). Drilling down into the types of regulation nationals support reveals that six in 10 believe the internet should be more tightly regulated to protect people’s privacy (59%). Support for privacy regulation is highest in Lebanon and lowest in the UAE (75% Lebanon, 44% UAE). About half of Arab nationals support regulation to make the internet more affordable, for culturally sensitive content, and for political content (54% affordability, 51% cultural content, 47% political content). Support for regulation to protect user privacy is stronger among more educated respondents. Fewer than one-third of internet users with a primary education or less favor tighter internet regulations to protect user privacy compared to nearly two-thirds of nationals with at least a university education (31% primary or less, 57% intermediary, 62% secondary, 65% university or higher). Regulations to protect user privacy have broader appeal among nationals who feel comfortable speaking freely about politics versus those who do not—by 12 percentage points (70% agree comfortable speaking about politics vs. 58% disagree).